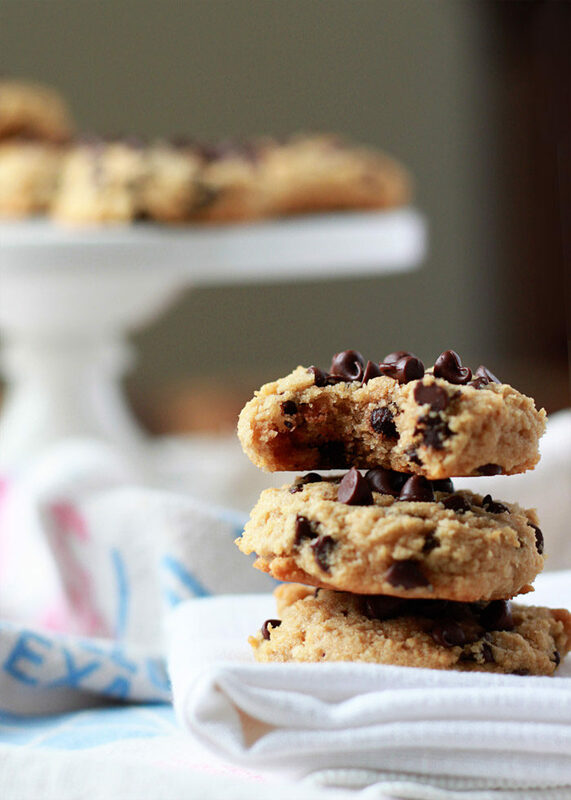 These bendy melt-in-your-mouth gems are an incredible gluten-free, dairy-free, and low-carb alternative to traditional chocolate chip cookies. 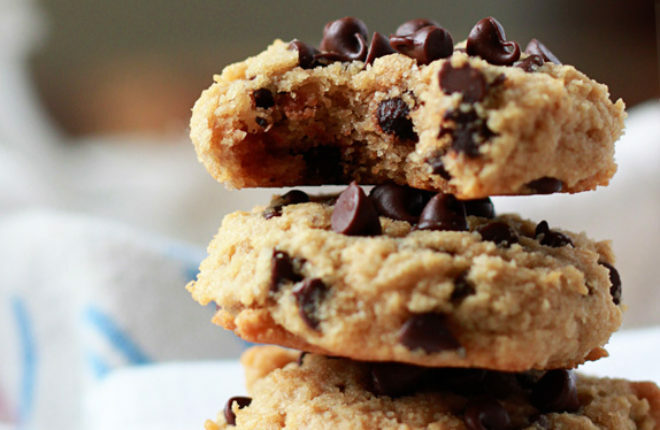 Remember those soft-baked chocolate chip cookies you’d buy in the snack food aisle? Bendy, pliable, perfect for sinking your teeth into one. Or – ahem – seven. For all I know, those soft-baked cookies are still available – as much has I’ve always loved Chips Ahoy, it’s been awhile since I shopped the cookie aisle. That’s not to say we don’t eat a few too many cookies in our house – they’re my daughter’s favorite thing to help make. Especially if they have chocolate chips in them. These chocolate chip cookies are her new favorite – and that’s saying something, because my kid is definitely on the selective side, particularly when it comes to her cookies. What she doesn’t know is that these Soft-Baked Almond Flour Chocolate Chip Cookies are gluten-free, dairy-free, and surprisingly low in sugar and carbohydrates. Not that she’d care – she just knows they’re delicious. So: expectations. 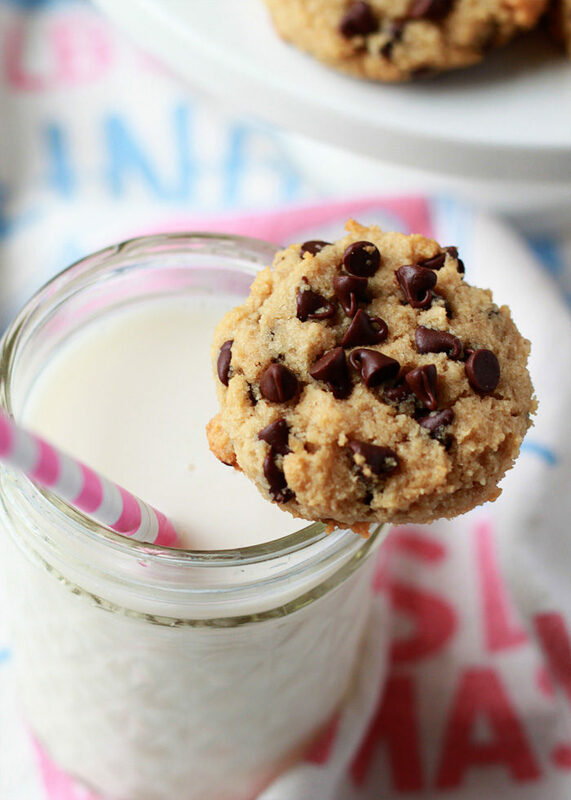 These are not your typical chewy chocolate chip cookies. As the title implies, they’re soft and bendy and they melt in your mouth and – yes! – they’re really, really tasty. 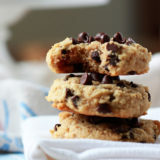 The almond flour does give them a bit more texture than your typical chocolate chip cookie, but we love it. They’re also very easy to make – the batter comes together in no time, and they bake up in a flash. Faster than a trip to the cookie aisle at the grocery store, for sure. If you’re gluten-free and you’re tired of sandy cookies, give these a try – they’re anything but. And if you’re dairy-free and missing cookies, I think these will fit the bill nicely. And! If you’re eating low carb, these might just work for you too. And if you just like cookies, well, these are also for you. Chocolate chip cookies for all! Preheat oven to 375 degrees Fahrenheit. Line a baking sheet with parchment paper or a silicone mat. Set aside. Add the coconut oil and the pure maple syrup to a large bowl. If the oil is very hard, microwave for a few seconds until soft but not melted. Stir briskly with a whisk until the syrup and oil are mixed together – this may take a minute or two. Add the egg and vanilla and whisk together until combined. In a medium bowl, stir together the almond flour, baking soda, and salt. Add the flour mixture to the wet ingredients and stir together with a wooden spoon until combined. Stir in 1/2 cup chocolate chips. Scoop mounded tablespoonfuls onto the cookie sheet, spacing about two inches apart. Press down gently with your fingers to flatten slightly. Top each with a few additional chocolate chips, if desired. Bake until set and the edges are golden brown, 8-9 minutes. Remove from oven and let cool for about 5 minutes, then transfer to a wire rack to cool completely. Cookies keep well in an airtight container at room temperature for 4-5 days. // All images and text ©Kare for Kitchen Treaty. These were yummy, but think your nutrition info is off quite a bit. I inputed all ingredients exactly as recipe calls for into myfitnesspal – mostly Trader Joe’s products, but surely to be comparable to usual grocery store ingredients. Wish I would have done that before I ate several thinking they were much lower in cals & fat! Thanks, Kristy! So glad you liked it! These are SO. GOOD. I just pulled them out of the oven and I am so impressed. Used almond meal (cheaper at TJ’s) but otherwise, made no modifications. I only hope they taste as good when they cool! Thank you for this healthy twist – will be making again and again! I’m so glad you like the recipe! Thanks, Kelli! Can you substitute some other flour for part of the almond flour? Like some tigernut or cassava or oat? I’ve not tried it, but if you do, please report back! I tried to make this Keto by using Lankato maple syrup and Lily’s sugar free (stevia) chocolate chips…. I ended up having to add a couple tablespoons of Swerve!! But other than that, they were pretty good! 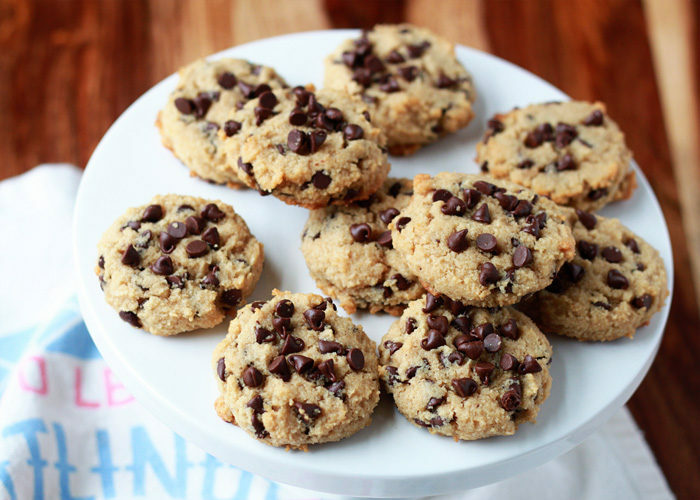 Maybe I’ll make them again with real maple syrup and still use the sugar free chocolate chips…..
Made these again as they were in high demand and so easy to make! The last batch turned completely soft the next day, so this time, I made a few changes – ghee instead of coconut oil and baked it for much longer, say double the suggested time, and turned to convection mode for the last couple of minutes. Turned out crispy with a soft centre, and stayed crispy beyond day 1.